Avengers: Infinity War features over 25 main cast members, most of whom have been players for several Marvel movies over the past ten years. But not all of these characters are being played by the same actors who originated them. In fact, the Marvel Cinematic Universe has had its fair share of recasting over the past decade, and not only the minor roles either. Here are the six biggest recastings in the MCU thus far. Warning: SPOILERS For Avengers: Infinity War contained within! The first big recasting in the MCU happened after actor Terrence Howard did not return to play the part of Tony Stark's BFF James Rhodes, a role he originated in the much beloved original Iron Man film. Supposedly, Howard was highest paid actor on Iron Man, and for reasons unknown, Marvel didn't want to give him a pay bump for Iron Man 2, so he was replaced with Don Cheadle, who has played him in every MCU film since. 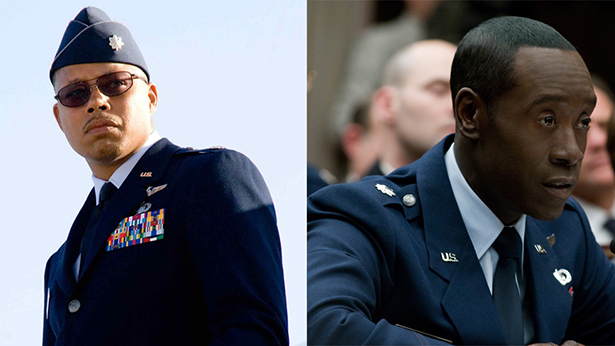 Although Cheadle has done a fine job, this one was initially jarring as the two actors do not remotely resemble one another. 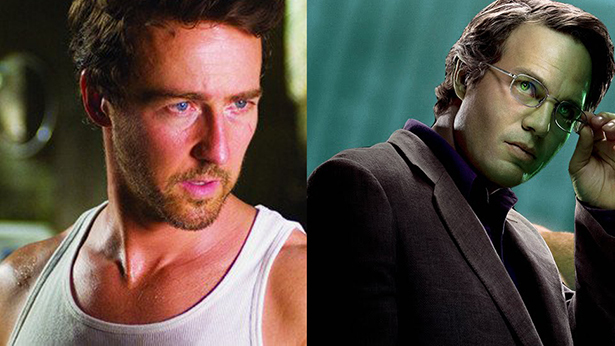 Probably the second biggest casting change was with core Avenger Bruce Banner, a.k.a. the Hulk. Originally played by Edward Norton in 2008's The Incredible Hulk, the film somewhat under performed, at least by today's Marvel standards. People seemed to genuinely like Norton's portrayal of Banner, but apparently he's the kind of actor who takes a lot of creative control over his character, and we all know that at Marvel Studios, boss Kevin Feige is the last word on everything. Coupled with the so-so response to The Incredible Hulk, and you can see why Feige replaced Norton with Mark Ruffalo. One of Thor's Asgardian buddies known as "the Warriors Three," Fandral was played in the original 2011 Thor film by actor actor Josh Dallas, best known for his role on ABC's Once Upon a Time. Due to his television commitments, Dallas couldn't return for Thor: The Dark World, and he was replaced by Zachary Levi. Both actors played the part with foppish blonde wigs, and so unless you were told, chances are you didn't even realize the role had been recast. Levi came back briefly in Thor: Ragnarok just to be killed off like a red shirt on Star Trek. Here's a pretty big one you probably didn't realize had been recast -- Thanos, the Marvel Universe's "big bad" and the chief antagonist of Avengers: Infinity War has been played by Josh Brolin ever since 2014's Guardians of the Galaxy. However. the first time we ever see the mad Titan was in the post credits tag in the original Avengers film, where he turns to the camera and smiles. For that brief scene, Thanos was played by actor, stuntman, and Alpha Comic Book Club co-host Damion Poitier. When Thanos was required to actually have dialogue, Marvel (probably wisely) recast him with a name actor. But Damion still appeared in a recent Marvel film -- he was one of Crossbones' henchmen in Captain America: Civil War. While the voice of Groot has always been done by Vin Diesel, the motion capture actor behind everyone's favorite living tree has been two different people. In the first Guardians of the Galaxy, the full grown Groot was played on set by Krystian Godlewski. For Guardians Vol.2, Groot was but a wee sapling, so he was all CGI. But teenage Groot in Infinity War is played by accomplished motion capture actor Terry Notary, known for his work on the Planet of the Apes movies. This is a case where there's no dramatic reason for the recasting, as the heights of adult and teen Groot are totally different and require different sized actors. Celebrated character actor Hugo Weaving gave us one of the best Marvel villains of the early MCU films with his take on the Red Skull in Captain America: The First Avenger. But in the years since then, the actor has publicly stated many times he hated the intense makeup it took to play the evil Hydra leader, making a return to the role seem unlikely. Nevertheless, the Red Skull showed up in Infinity War in a surprise cameo, and he looked pretty identical to Weaving's version. But it wasn't him, it was The Walking Dead actor Ross Marquand. Aside from playing Aaron on that show, Marquand is known for his vocal imitations of famous actors, so it's no wonder that Marvel picked him to replace Weaving. Which has been your favorite (and least favorite) recasting in the MCU? Let us know your opinions down below in the comments.